I go to hot topic once a month. Mainly to get berated at by girls with multiple face piercings. It turns my crank. But the My Little Pony Variants from Hot Topic do stupid things online. I mean, they did a Doctor Who My Little Pony #1 cross-over variant cover AND a Say Anything My Little Pony #2 Cross-over variant, all selling for double what you buy them for at Hot Topic depending on the sale and the store and the time. Which leads me to this weeks pick. If there is one property that keeps getting a huge response its My Little Pony. 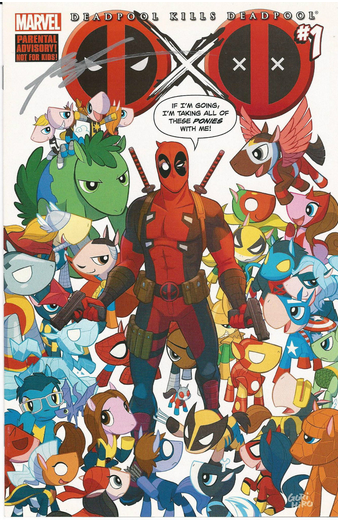 I was sorting boxes this week when I noticed the My Little Pony #1 first print Box Set sells for double the retail price at $50+, not to mention the increase value in almost all My Little Pony related variants – The My Little Pony Deadpool #1 SDCC Cover is a $50 + book. Which is outrageous. and this week there is a homage/tribute/fan book written by Steve Seeley (Hoax Hunters) with a cover by Tim Seeley (Hoax Hunters and Revival). If there is one book that comes out this week with any potential of growth, I think, its dynamite’s My Little Phoney #1. I’ll talk about The Netflix Marvel Deal and why it would be a good idea be thinking about the Thunderbolts and Heroes For Hire. Why you shouldn’t be speculating on the New Amazing Spider-Man #1 if you’re paying cover. I happened across this by chance while looking for something else. I’m not a speculator or anything like it, but I am a brony who’s avidly collected the IDW comics since the start. Just a couple points that came to mind. The Hot Topic #2 is coveted in the fandom not because of its scarcity or what it might be a crossover with. It’s coveted because of the identity of the pony on the cover: she’s a massively popular character with the fandom. There’s an SDCC cover of #9 with the same pony on the front that’s coveted for exactly the same reason. Similarly, the Midtown #1 and Lone Star #1 are by the same artist – but the Midtown #1 is far more popular, entirely because of the pony on the cover. As for My Little Phony, I had a quick look at that in a comic store recently. I really hope they weren’t hoping for a brony takeup, because they won’t get it. It’s not terrible, but it’s nothing like as good as the best parodies the fandom itself has already produced. To be honest, I could see this ending up in some demand by people who buy it in the hope/expectation of selling it to bronies – but then sitting unsold when the bronies themselves pass it by.